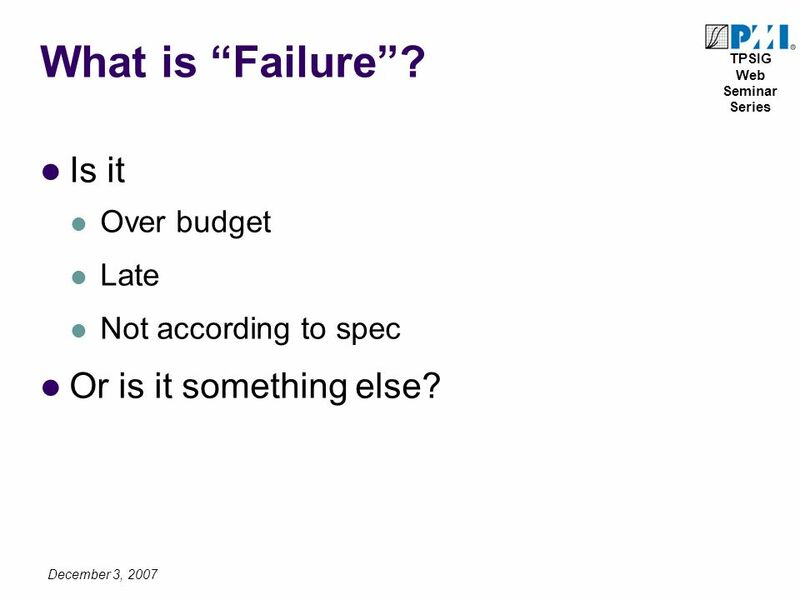 TPSIG Web Seminar Series Real-Life Projects www.rlprj.com Sponsored By: What is "Failure" Anyway? 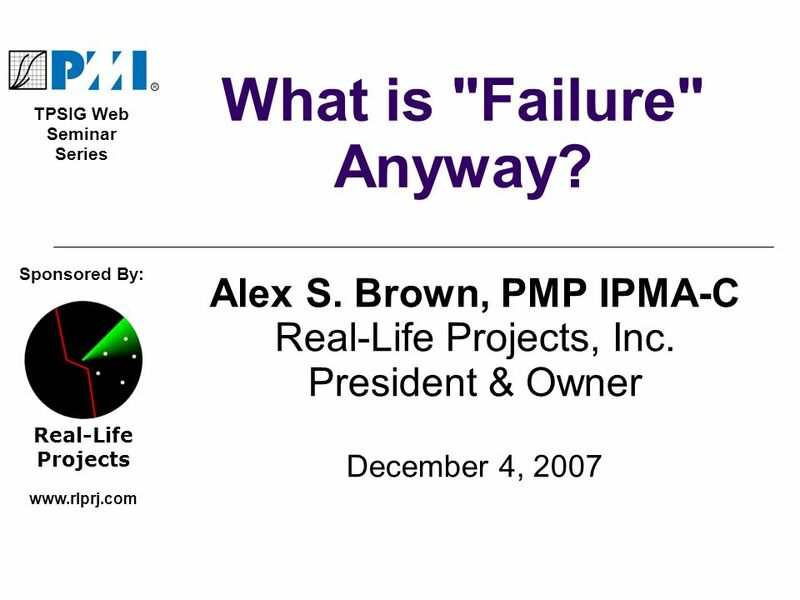 Alex S. Brown, PMP IPMA-C Real-Life Projects, Inc. President. 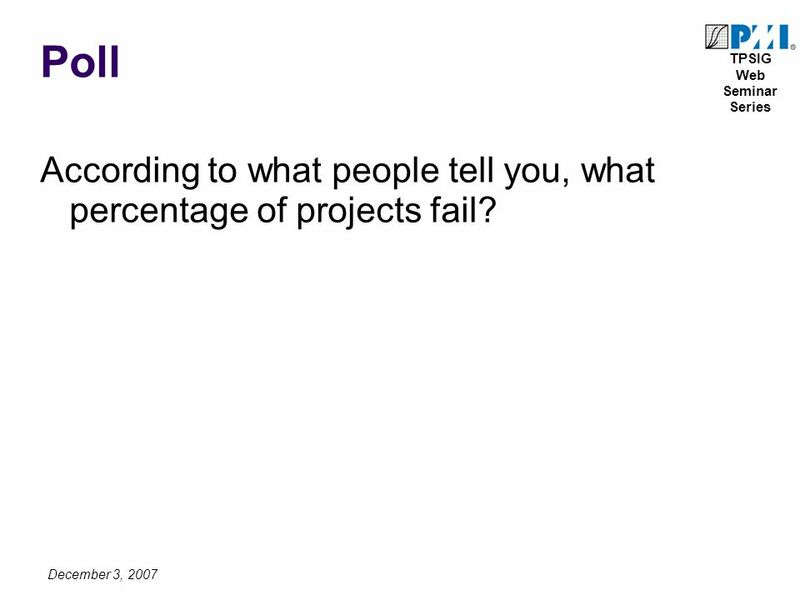 4 TPSIG Web Seminar Series December 3, 2007 Poll According to what people tell you, what percentage of projects fail? 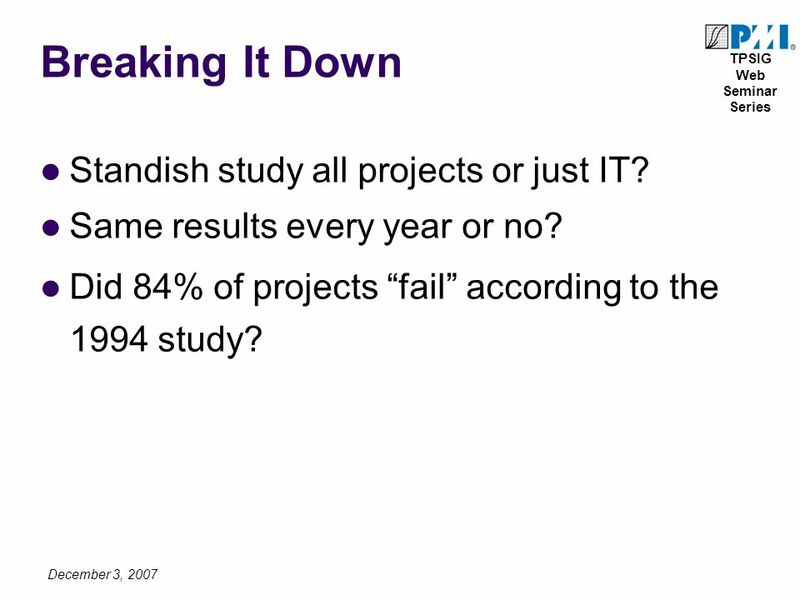 6 TPSIG Web Seminar Series December 3, 2007 Breaking It Down Standish study all projects or just IT? Same results every year or no? 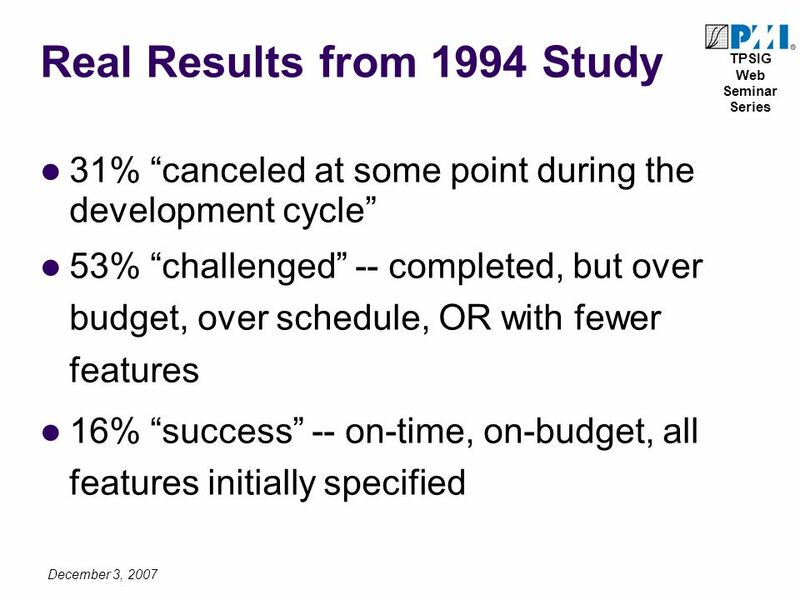 Did 84% of projects fail according to the 1994 study? 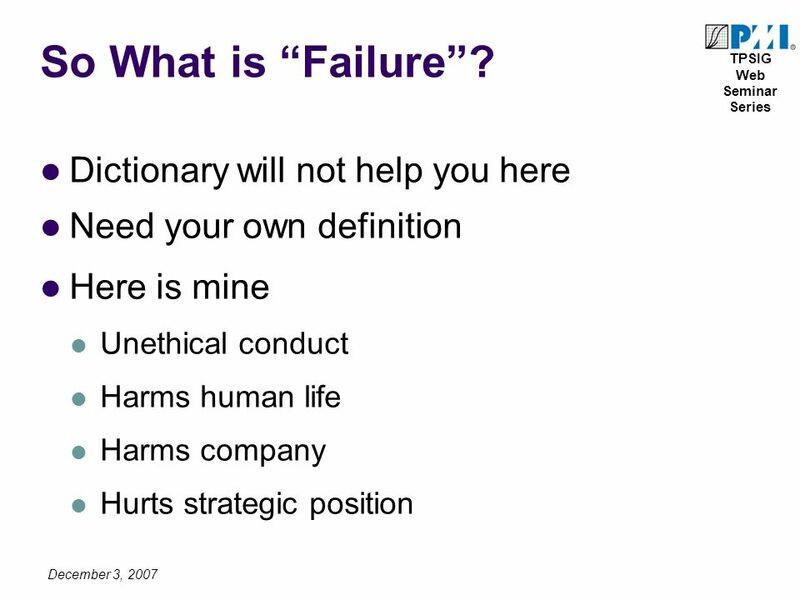 9 TPSIG Web Seminar Series December 3, 2007 What is Failure? Is it Over budget Late Not according to spec Or is it something else? 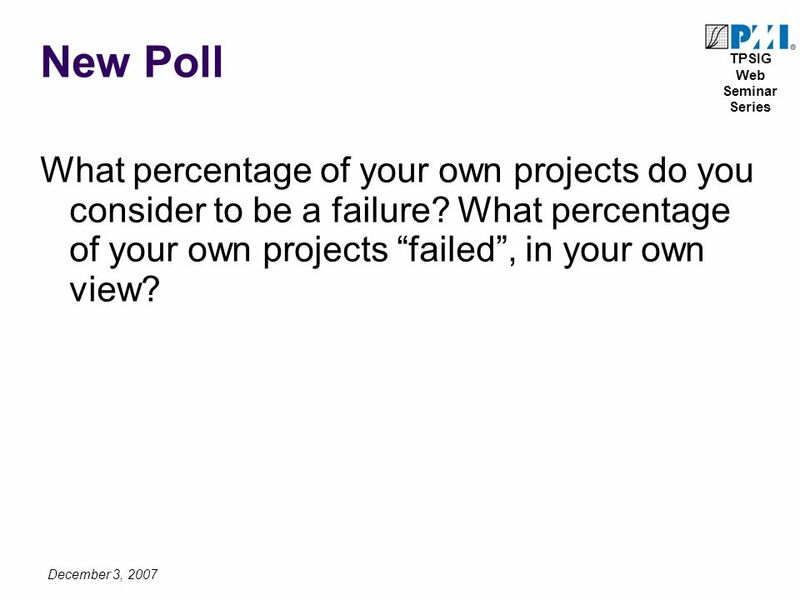 10 TPSIG Web Seminar Series December 3, 2007 New Poll What percentage of your own projects do you consider to be a failure? 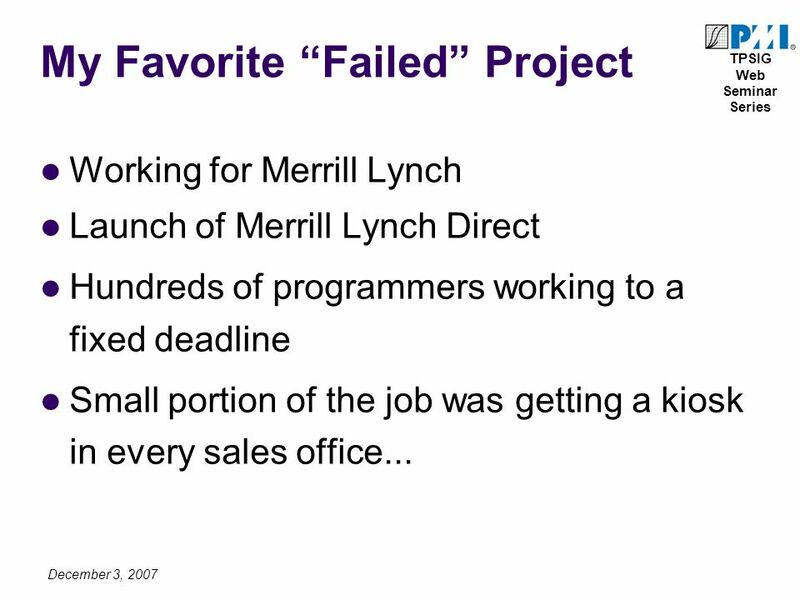 What percentage of your own projects failed, in your own view? 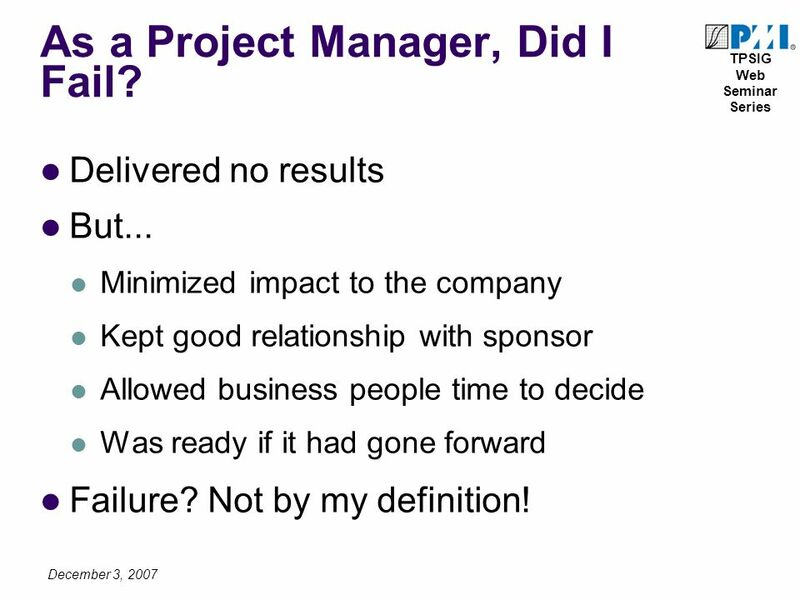 12 TPSIG Web Seminar Series December 3, 2007 As a Project Manager, Did I Fail? Delivered no results But... Minimized impact to the company Kept good relationship with sponsor Allowed business people time to decide Was ready if it had gone forward Failure? Not by my definition! 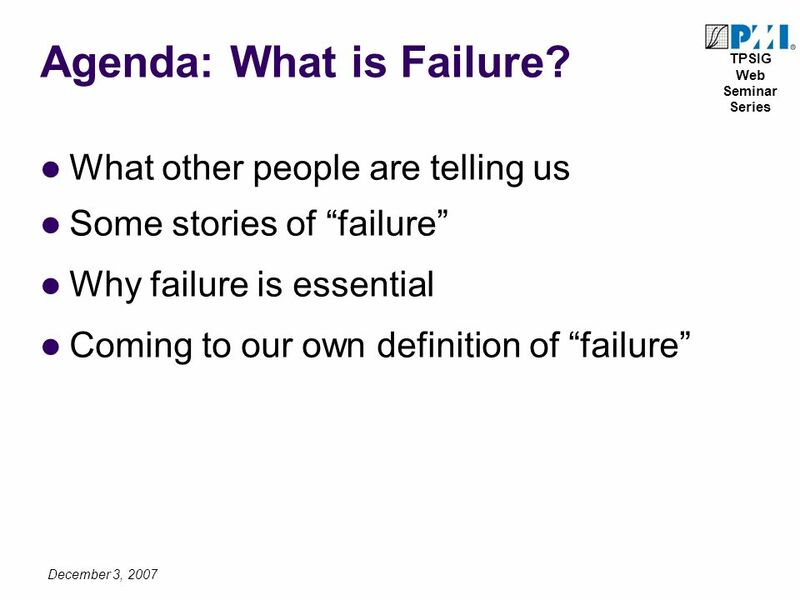 15 TPSIG Web Seminar Series December 3, 2007 What is Failure? I cannot tell you. It is a decision each one of us needs to make for him or herself. 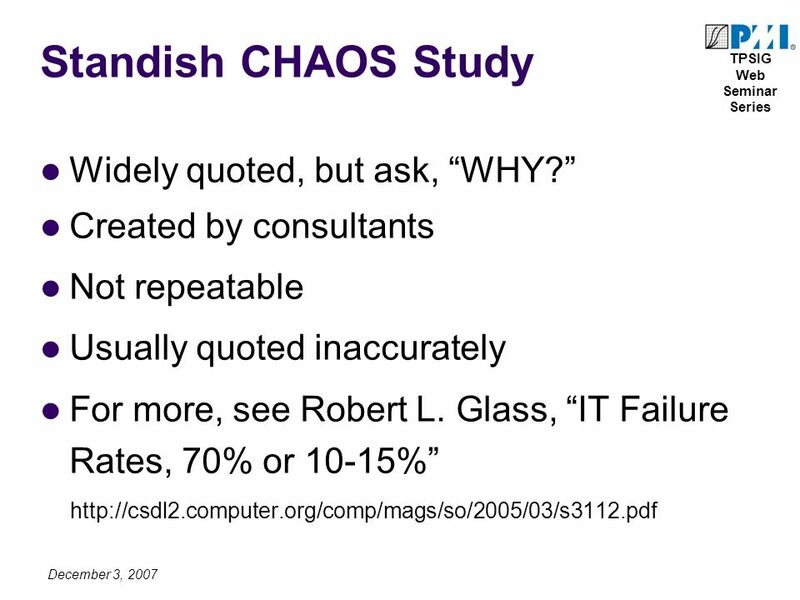 Perhaps someday when a study says, 80% of projects failed, we will say, Who cares? Instead of, Sign me up for that lecture! 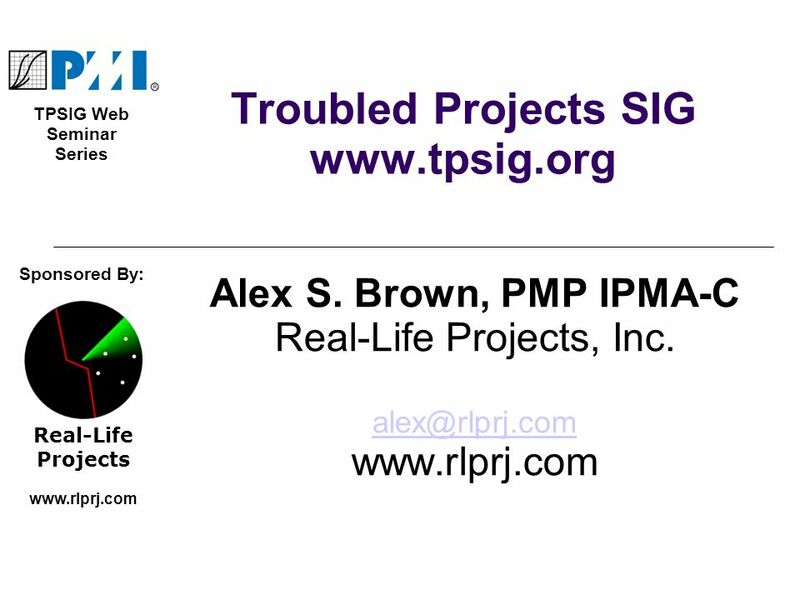 Download ppt "TPSIG Web Seminar Series Real-Life Projects www.rlprj.com Sponsored By: What is "Failure" Anyway? 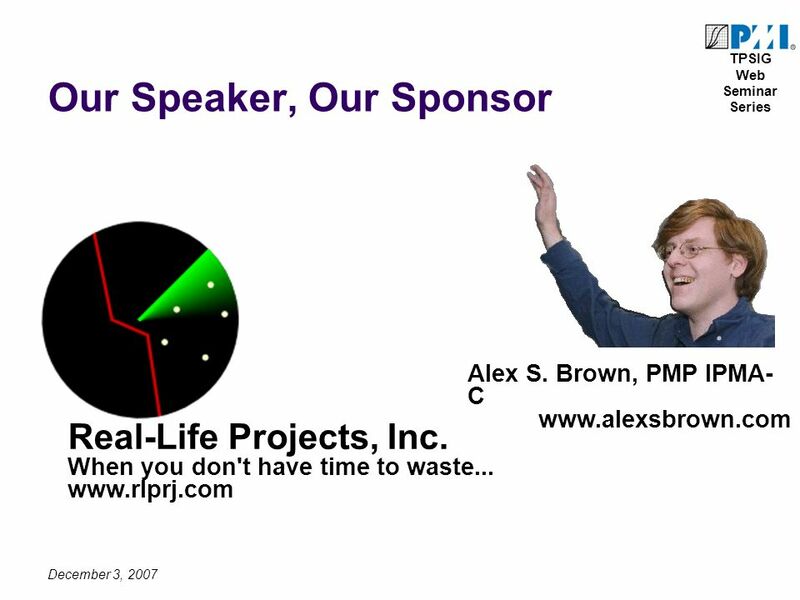 Alex S. Brown, PMP IPMA-C Real-Life Projects, Inc. President." 1 1 Media as a Partner Lee Ann J. Kendrick, M.Ed. Regional Advocacy Specialist, National PTA. Good Morning! Today is ____________________. Applying evo to a project An Agile and EVO Workshop Based on the article Measuring Agile Value in Overload 89, by Ryan Shriver, and used with his permission. Margareta Sandström Kjellin Mälardalen University, Sweden Pupils and Teachers understanding of the Nature of Classroom Dialogue in Sweden. Measuring a Web Project's Financial. Todays Agenda 1. Review Project Management Principles 2. Project Management Institute (PMI) Framework 3. PMI Processes 4. Break into Project Teams and. Providing sales and service follow-up calls to new car dealers for over twenty five years AUTOCOM Sales and Service Follow-up Calls Next >End. 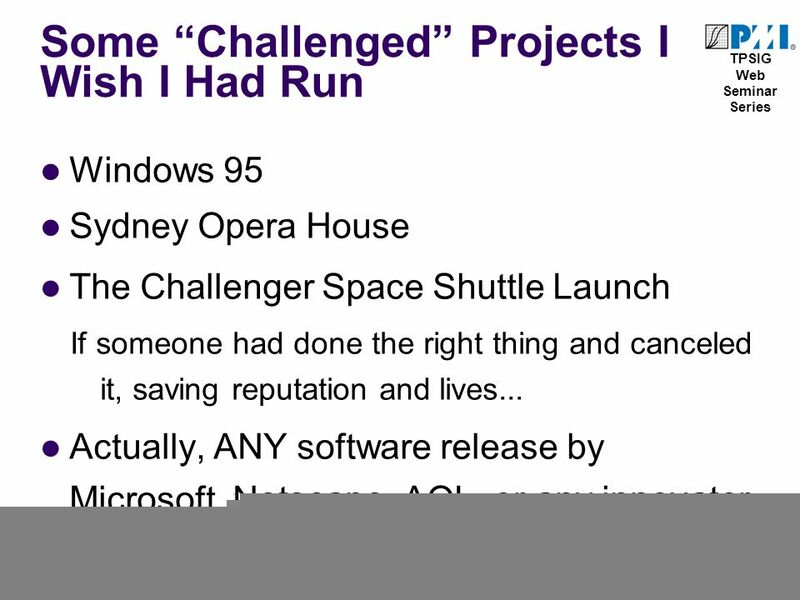 IT Project Management Greg Dexter City of Los Angeles Cheng Li Cal State Los Angeles. 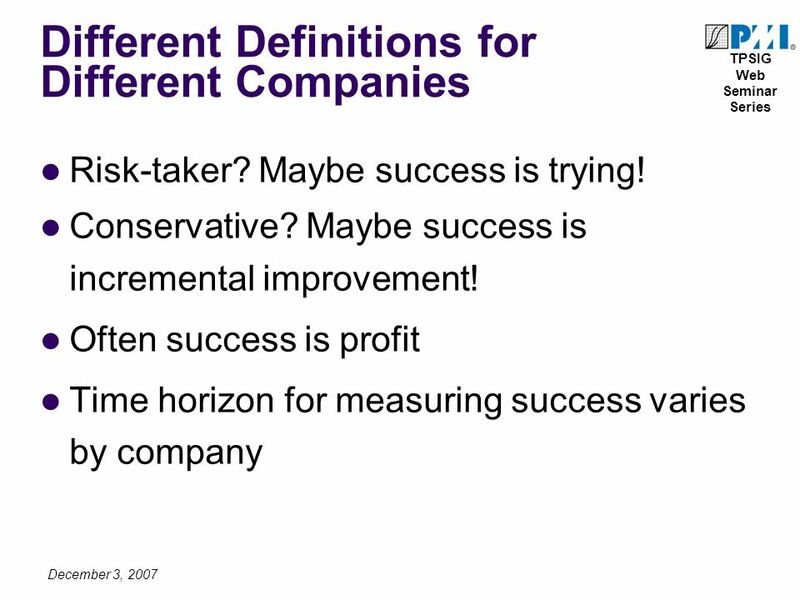 IT in the Real World A look at IT in a Fortune 500 company Ed Nelson. 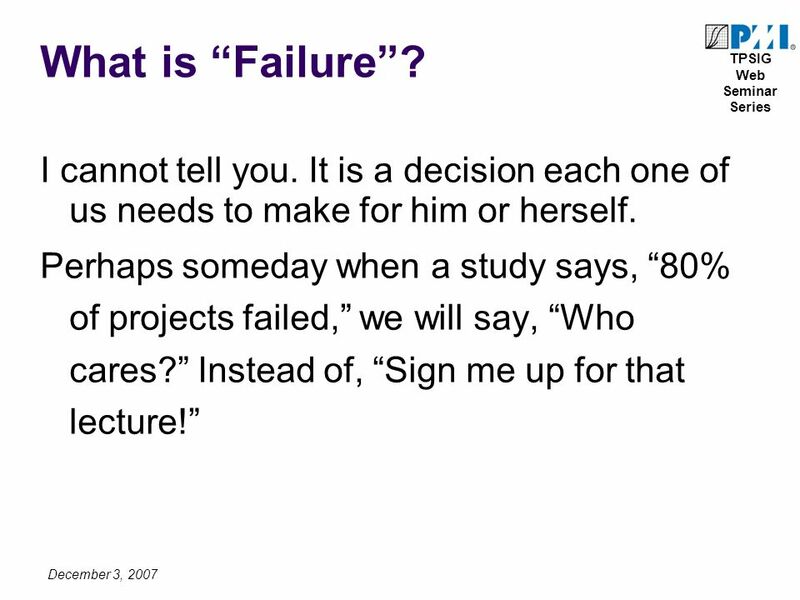 Lecture 2 1 Introduction to Software Engineering. Tools for Improving Competitiveness María De Los Ángeles Rivera, CPA – Partner, Kevane Grant Thornton Red de Mujeres Empresarias CCPR January 19, 2012. I Can’t, I’ll Try, I Will Positive Vocabulary. Objective: To understand how using ‘I Will’ sets one up for success and using ‘I Can’t’ or ‘I’ll Try’ sets. ORGANIZATIONAL PROFILE By: Christina “Cryss” Lynch. Downloading & Installing Software A Module of the CYC Course - HomeConnect 9-22-10.